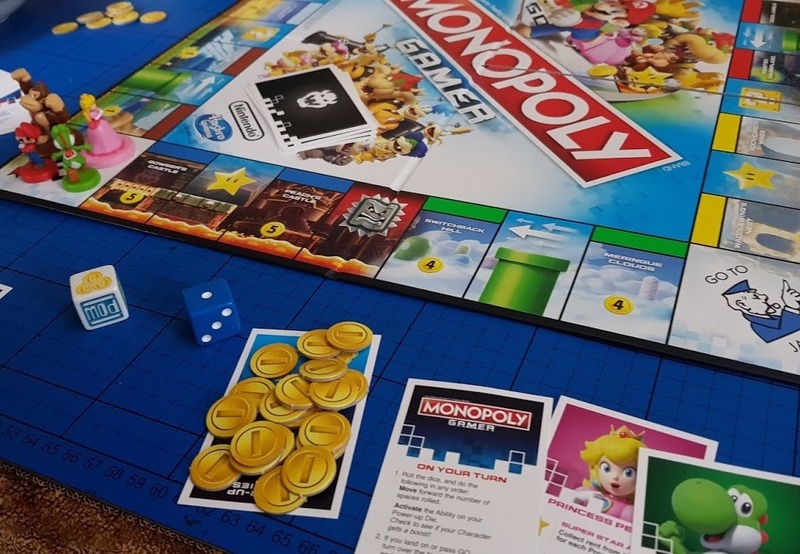 Monopoly is possibly the most famous (and infamous) family board game and has given rise to many editions, one of the latest being the Monopoly Gamer Edition. 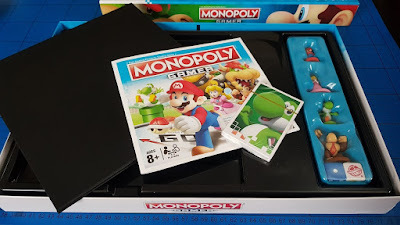 This is Monopoly mixed with Nintendo gaming and it works very well. No more £10 notes, you are collecting gold coins and Power Up boosts and you can even play as your favourite Nintendo characters. The Monopoly Gamer Edition comes with a Nintendo Character Pack, so instead of Iron or Cruise Ship, you can be Mario, Donkey Kong, Yoshi or Princess Peach. They are very nicely made and definitely fun. Also inside the box are the game board, 2 dice - 1 regular and 1 special 'Power Up', 4 Character Cards, 4 turn reminder cards, 8 Boss Cards, 16 Title Deed cards, 90 coins and instructions. 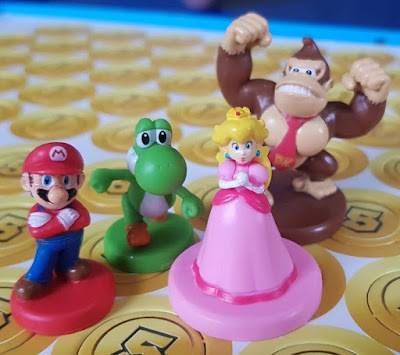 The board is great - slightly different to the original with only 8 spaces on each side, including Special Move spaces and coin drops. 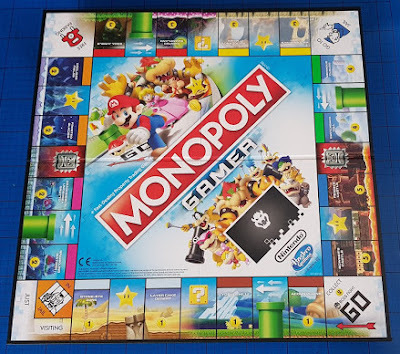 All of the property locations are based on Nintendo Games and each has a pair to complete the 'set'. There are the more familiar Free Parking and Go To Jail spaces too! Currency is simplified, with less popular property spaces costing only 1 gold coin and rent being 1-10 coins. This has meant my 7 and 8 year old boys can do all of the sums themselves quickly and has given them real confidence with multiples of 2 and 5. They were twice as fast after a couple of games. Each turn the player throws the two dice and then can move and use the Power Up in any order they choose. 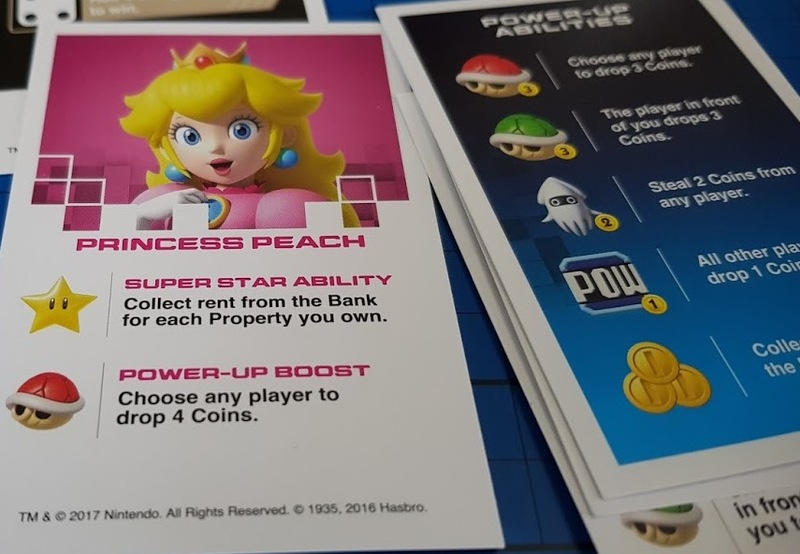 There can be a real bonus to using the Power Up first as other players might drop things you can collect as you move past, or you can gain Gold Coins that will be helpful when you move. 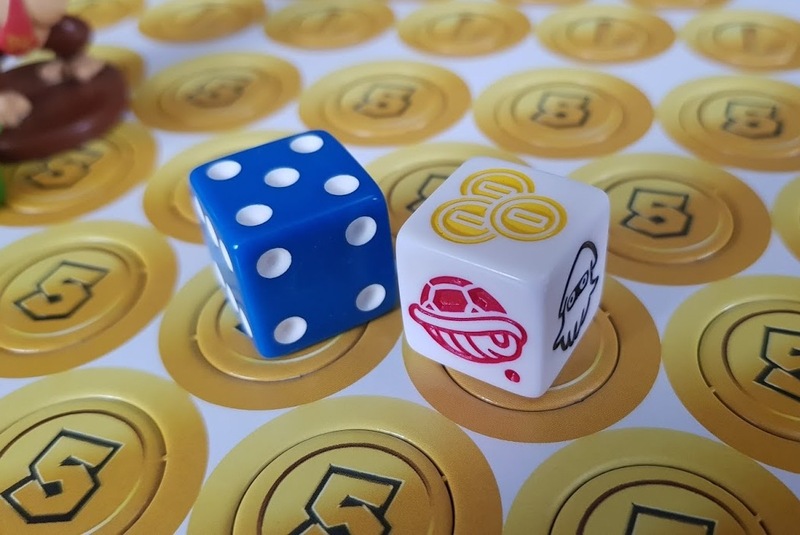 Each character has a Super Star Ability and when they throw the Power Up Dice and it falls on the matching side, they get a Power Up Boost. Often these can be applied to any other player, so tactics can really play a part. 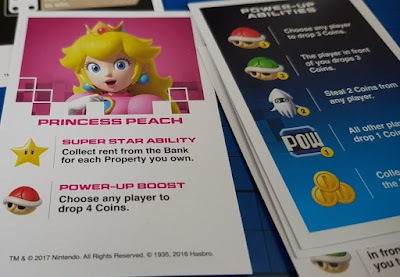 When a red turtle is thrown for example, you choose any player to drop 3 coins, but Princess Peach gets her boost, so they'd need to drop 4 coins. There are turn reminder cards, which are helpful especially when you start playing, and the final set of cards are the Boss Cards. 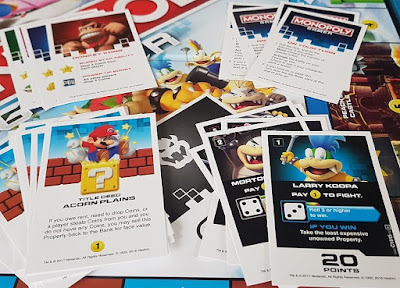 Whenever someone passes 'Go', a Boss Card is drawn and must be defeated. Players take turns to try and defeat them if the player who drew fails. Defeating a boss gives you a big bonus and counts towards your final score at the end. It's also pretty cool - some of these bosses are legendary! 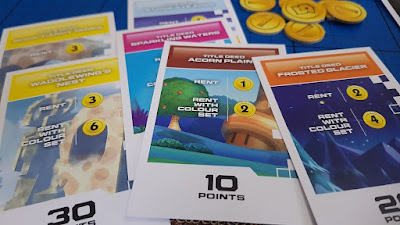 It's suggested that a game will only take about an hour, we found it took about 90 minutes either playing with 3 players or with 2 players in the slightly different 2-player version of the game (you each take 2 characters). I can see this will get quicker as we become more practised though! At the end of the game scores are counted up in multiples of 5. Points are scored for Gold Coins, Property Values and Boss Cards. I currently have a definite advantage over my younger children in that I am more familiar with original Monopoly, although they are improving each time we play and I'm not! A good family game and a great alternative, lighter, quicker version of the classic. Less cut-throat and money-driven, more about beating the bosses. It's a good mix of classic board game and console gaming nostalgia. 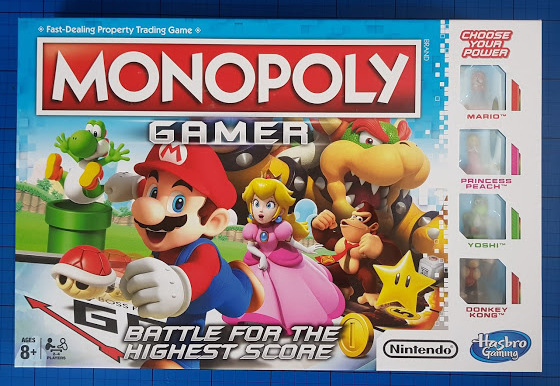 Monopoly Gamer Edition is made by Hasbro, recommended for 2-4 players aged around 8+ and available to buy now rrp £27.99 at all good toy shops including Smyths and online on Amazon. 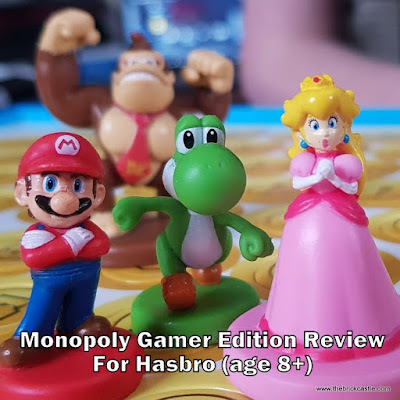 We were sent our copy of Monopoly Gamer by Hasbro for review.